The Leadership Living Learning Community (L3C) is an internationally award-winning Academic Living Learning Community centered in learning more about the relational aspects of leadership and the concepts of self and community. It is open to all majors on-campus. 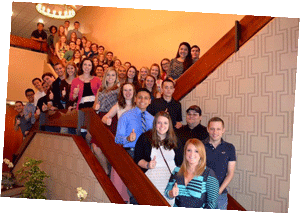 living Texas A&M University’s core purpose of developing leaders of character dedicated to serving the greater good. In addition, students in the program are welcome to apply to continue with the program in their sophomore year as L3C Peer Mentors. This allows for an increased understanding of leadership through practice. L3C Peer Mentors complete a three semester credit hour curricular course in leadership education (ALED 340 – Survey Leadership Theory) in the fall semester and a three-four semester credit hour curricular directed study course in the spring semester. Many decide to earn a university minor in leadership while completing their role as L3C Peer Mentors. Be accepted to live in Texas A&M University residence halls through the Department of Residence Life, with the exception of the Corps of Cadets. Be assigned peer mentors who are student leaders who were in Leadership Living Learning Community the previous year. These buddy huddles are small groups to help you transition to the university and get the most out of your Aggie experience. Credit 1. Offered to students living in the Freshmen Leadership Living Learning Community; fundamentals of developing personal leadership while participating in co-curricular activities; emphasis on the relational model of leadership and global perspective building. Go to an excellent overnight retreat to get you started and to introduce you to your Leadership Living Learning Community neighbors in the fall semester. During a specific period of time, students selected for this program will be able to choose a roommate(s) from other students selected for the same Living Learning Program. Students may post profiles within the myHousing Portal and view responses by other students to their roommate questionnaire (i.e., sleep schedule, noise, cleanliness, etc.). Following this specific time period, students will be assigned a room with their requested roommate within the block of rooms designated for the Living Learning Program.